I agree with five observations fully. I also think that these apply to crashes after appropriate word changes. I would think that somewhere there is a divine rod that would warn of impending crash! Unfortunately, I do not have one. There is/was a well-known fund manager who looked for two standard deviations from the norm, IIRC. Obviously, you will miss many corrections, and may even act too early. Nevertheless, you should probably view PEs outside their 2 sd as being highly abnormal, with markets ripe for correction. I doubt that we have such a situation with PEs at the moment, so that no clear signal is being given in that direction. 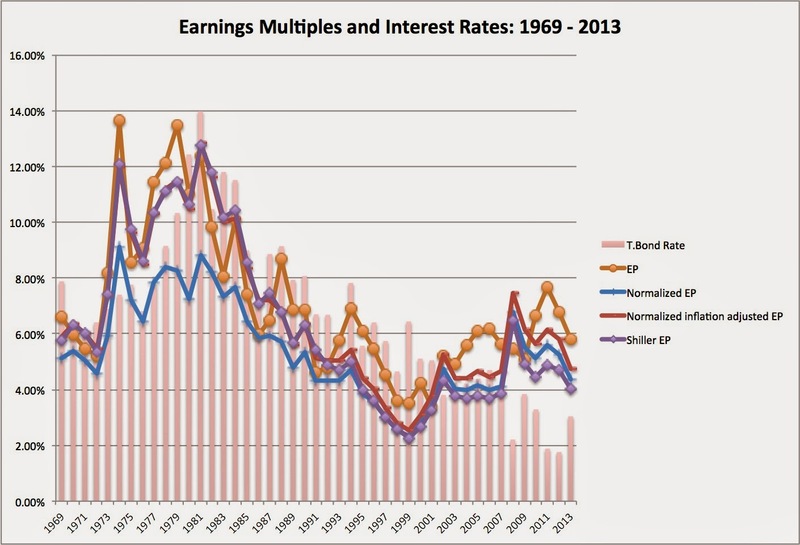 When looking at EP ratios vs. interest rates, are you using real or nominal interest rates? I had always thought that inflation would increase both the interest rate and growth rate, and would thus be a wash, making the real interest rate the only relevant metric to compare to EP ratios. 1.Conceptually, does the latter mean that at a sectoral level forward looking estimates of operating leverage and/or financial leverage are getting reset so the sector beta is getting reset? 2. Secondly for the sector from which money is diverted away, could it be there is a misappraisal since the growth, operating leverage, financial leverage etc of that sector may be totally unrevised & prices fall only for reasons of fund diversion. In a sense, does relative valuation then enter intrinsic valuation through the beta reappraisals? I'm not sure why quartiles would be the best angle to explore bubbles. Also, it would be interesting if you looked at predicting returns over alonger time horizon. I think it can make sense to avoid sectors you see a bubble in. For example, during the tech bubble and housing bubble, you may have suspected the bubbles existed. I don't think it would've been wrong to avoid tech, housing, financials, etc. during that time. You had many other sectors you could invest in. Right now some people believe there's a bubble in China and I don't think it's a bad idea to cut your iron ore miners and Chinese banks if you want to manage that risk. Thank you professor for this awesome article. I really had to chuckle hard with your characterization of types of "bubble heads". so true though! In response to some of the comments, I think that you can have bubbles in individual sectors, where the trade off shifts towards action for two reasons. The first is the cost of acting becomes lower. Rather than settle for the risk free rate as your return, you get the return in the rest of the stock market. Second, your odds of correction increase, simply because the bubble sector at some point in time stands out so much from the rest of the market that denial becomes impossible. On the question of nominal versus real interest rates, I am using nominal rates and it may well be worth looking at real rates but you would then have to also look at real growth. I was unaware with the fact that Rational Babblers uses market metrics that are both intuitive and widely used, note their divergence from historical norms and argue for a correction back to the average. Great stuff. Thank you so much for sharing. Thanks for applying logic to an issue which has a lot of opinion and view circulating. Fear of loss may drive us to worry about bubbles and their bursting. Is there an issue about availability of credit which also drives us to encourage investment and overvaluation which we then worry will evaporate when the lending is eined in? Professor, regarding the intrinsic value calculation, if Buybacks are concurrent with increased leverage to fund them, will that not change the equity risk premium? Yes. If buybacks were predominantly funded with debt, the answer is yes, but they are not. Only if you're considering buybacks net of issuance. Historically, the market has been diluted by about 2%/year due to secondary offerings, option grants, etc. In recent years, the dilution has been closer to zero due to higher buyback rates. In any case, your ERP calculation doesn't appear to consider NET buybacks. The 50-share Nifty of the NSE ended 18.10 points, or 0.24 percent, down at 7,493.35 after shuttling between 7,534.80 and 7,441.60. Loved your descriptions of the different bubblers, so true for all of them. Thanks for sharing professor! Looking at T-bills as an alternative to EP makes allot of sense. But, the level of return from T-bills is the lowest in history (history = the graph you are using to make your point). In my opinion that is a significant point because when T-bills stop being an "interchangeable" product to EP they stop being a benchmark as well (pushing all the potential "costumers" to other markets - like stocks). Provided here very useful information about cost and benfit market timing which is very useful for all of us in any way. Thanks for sharing here. If you do not start by keeping people foremost in mind you are bound to fail. After all, when we talk about markets we are really talking about people and when we create marketing plans we are designing ways to effectively communicate with people. Doesn't your post leave out an important dimension - the rapid monetary expansion over the past few years. The risk called out by many of "bubblers" is based on unknown/unintended consequences of that rapid expansion of monetary base. RISK is that it leads to inflation taking off or a panic when Fed tries to normalize the Monetary policy . The operative word being 'risk' - i don't think it is an eventuality. None of the formulas you have presented captures this risk. Isn't it rather disingenuous to attribute a call of a "bubble" to Prof Schiller when he is rather nuanced and talks about risks . In the CNBC video you have linked, he only refers to "little bubbly" and have a few caveats before and after that sentence. I am sure that you are aware that there are many pundits who are perma bears as there are perma bulls. perhaps derogatory adjectives (are there any good/rational of 'bubblers' ? in your mind ) is not the best start to have an objective analysis . I usually like your analysis - even if i occasionally disagree with your conclusion. In this case , I happen to agree with your conclusion that there is no "big bubble" in markets - but rather disappointed with your analysis. Great post. Please can I have permission to publish in my newsletter and blog. Thaanks prof , may i share into my blog . Like your analysis. Don't you think in the last 3.5 decades USA as a country has transformed from a economy perspective - more matured ? The only insight i miss is how does one catch the "Shift in PEs"
Is it possible that P/E ratio isn't the best metric for evaluating whether or not we are in a bubble? Earnings are in part based on revenue. Revenue is susceptible to fluctuation based on consumer or business:(i) savings, (ii) investment alternatives to consumption or expense, and (iii) view of future income - all of which would be highly correlated with a market correction. 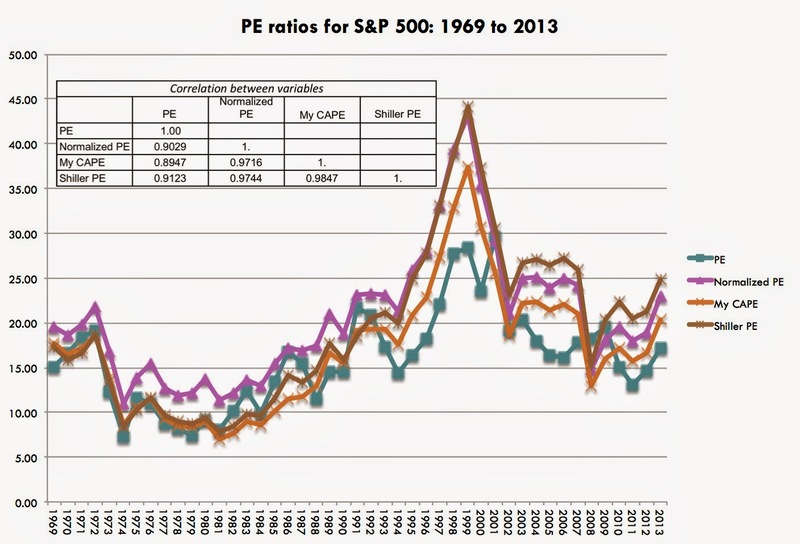 I think the problem with this analysis is that PE is a better predictor of a bubble than ERP. 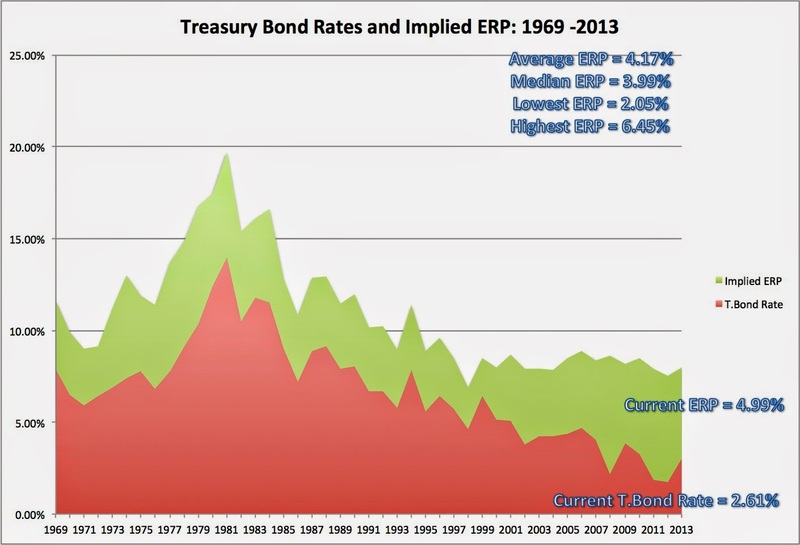 In 2000, for instance, the Implied ERP was 2.87, but we still had a bubble -- I guess combining both these might be able to better predict a bubble. Professor I agree with what you've written about P/E E/P not showing the full picture but curious to know why you did not show future returns based on ERP quartiles... ? It's great to see someone else disagreeing with Fama. We're a little bit skeptical that bubbles can be rational though.